Whether you’re new to leadership or have a new position, establishing a strong personal brand and creating One Vision is critical to growing your influence as you lead the organization in One Direction. 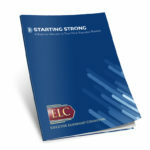 This insights paper brings together the latest research the challenges of starting a new executive position, the impacts of the transition, what your boss or board wants from you, and Executive Leadership Consulting’s recommendations on the 4 Keys to Starting Strong. Our objective is to give you insights and direction so you can proactively beat the obstacles and successfully lead your new team. Receive a complimentary copy of this insights paper by filling out the contact form.